When snow falls it also covers, reducing objects and spaces to bare forms that archive the shape and barriers a particular environment has. 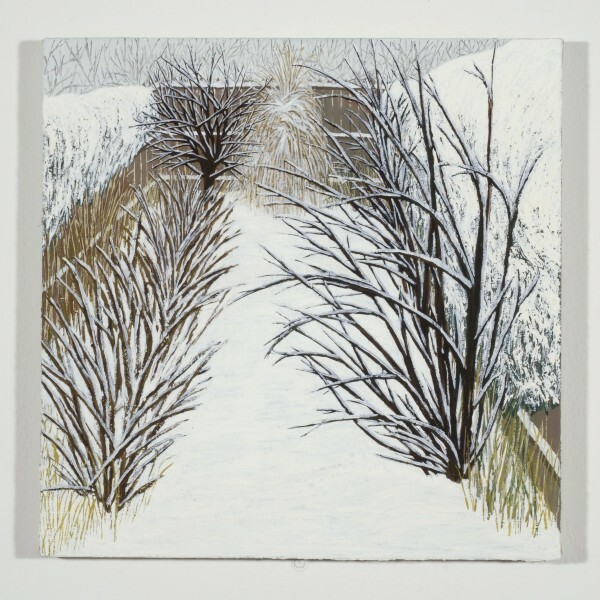 Consider a painting by Becky Suss titled Kensington, Winter, on display this past fall at the ICA. This painting depicts a backyard in Kensington after a snowfall and, to me, seems a perfect depiction of depression and Seasonal Affective Disorder during winter in Philadelphia. Before delving deeply into Kensington, Winter, it is important to understand some details about the subject of the painting. According to The United States Census Bureau, 61.46% of households make less than $34,999 in the three zip codes associated with the neighborhood of Kensington in North Philadelphia, more than twice the average of the rest of the country. Keeping these specific circumstances in mind, as well as the notes about SAD, and Cvetkovich thoughts on depression, I want to consider Suss’ Kensington, Winter as a work that exemplifies the ways weather can encourage depression. Admittedly, this is a lot of pressure to place on a work of art, but Suss captures a powerful sentiment beyond the scope of a simple landscape. The painting depicts a private backyard in the Kensington, which is enclosed by fences, filled with shrubs and bare trees existing as snow avalanches across the picture plane. By utilizing stillness, nostalgia and quietly intense looking, the drabness of the scene cannot be untangled from economic conditions of the subject, or the feeling of depression in general. Kensington, Winter is fairly diminutive at 16 x 16 inches. The general composition of the piece is dictated by the fences she paints, which structures a space within a private backyard. The fence, which is the brightest (yet still dull) element of the piece creates an enclosure within which most of the image appears. The left and right side of the fence are covered in white forms that are relatively abstract, which fortifies the composition and makes the already private space increasingly closed off. Winter, here, actively piles on a pre-existing fence, turning a space that is already separated into one which the viewer can barely see beyond it. The snow accentuates a heavy divide of inside and out, stopping the already little chance we had at seeing beyond the enclosure. Within the fence are a variety of different plants, shrubs, and trees beyond the snow. In the foreground, shallow shrubs are painted abstractly and poke directly towards the sky. Lining the left fence are a series of individual plants, but as you move back in the picture plane each plant’s branches overlap and the individual plants lose any sense of definition and singularity. Just inside the back of the fence, are two rather different trees, one jagged and dark brown, the other wistful with sprawling yellow ochre branches. Comparatively the plants in this scene have little in common whether it be their thickness, the quality of their branches, or the way they occupy space. The primary similarities they have is their reality of existing within a backyard with their eerily still quality, a consistently recurrent theme in Suss’ work. When discussing this painting with others, rarely was any sense of sadness described. Many spoke of the piece as what it feels like in their own backyard and the painting registered as an archive of nostalgia to them: like when you are alone in your house in the morning after a snowstorm. I certainly don’t discount the heavy aura of nostalgia within this piece. If this painting registers to one as a memory, it also registers as what is gone. Its appeal, for those who relate to it, is the memory of previous years looking into a frigid backyard. This feeling is coupled with the assumption that this year, too, the backyard will be covered in fresh snow and one will, again, be alone in their home. The emotion embedded in this piece is a stillness that is both what has happened, and what will happen (yet) again. 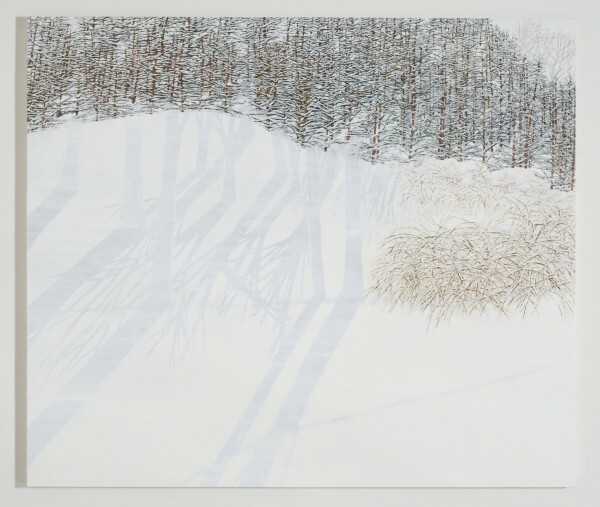 Consider a second painting by Suss: 1974, 1984 depicts a rural landscape recently covered in snow. As the title suggests, the single painting depicts two different seasons separated by 10 years. Since the painting was completed in 2010, the work embodies three different times in one single image. Through its assumption that multiple seasons and spaces can be represented as a single painting, with the same emotional register, this painting alludes to stillness and the lack of change across multiple decades. This painting deeply informs my suspicions of Kensington, Winter, which revels in a similar scene to conflate stillness with lack of change. Kensington, Winter, is a depiction of a neighborhood that has certain economic conditions, depicted as being frozen, both literally and figuratively. Snow acts as a sort of deadly, serene stamp marking the end of one year with the beginning of (yet) another. But this blank whiteness isn’t a clear slate as much as it is the reminder of what hasn’t changed, what seems endlessly redundant. It could be argued that my reading of Kensington Winter is from my position as person with mild SAD. I wouldn’t disagree, and If I were asked to describe what my self-diagnosed SAD felt like, I think I could use this painting to help articulate it. Kensington, Winter occurs while the socio-economic conditions of unknown neighbors are just beyond the fences, in the periphery. 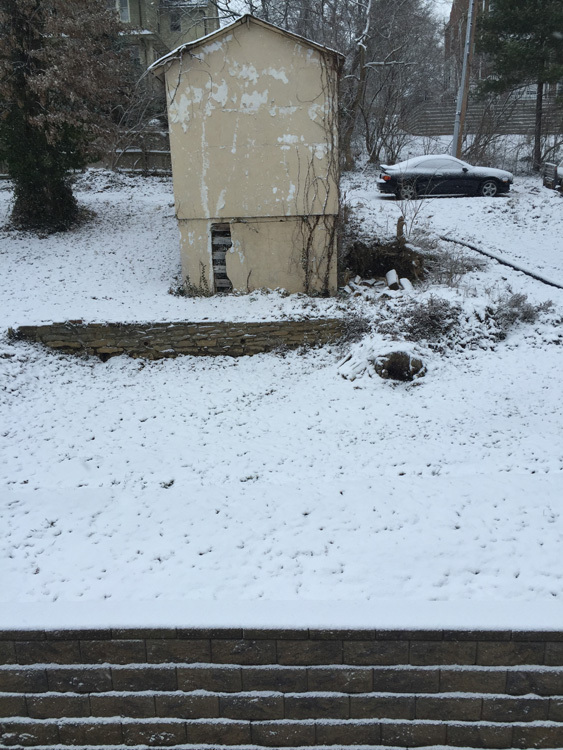 Pictured above is an image taken from an iPhone of my sister’s backyard in Cincinnati, on a morning where I happened to be alone in her house. The similarities between this image and Suss’ painting are duly devastating, a mundane reminder of how ubiquitous the scene of Kensington, Winter is. This ubiquity allows the work to move from personal to impersonal, a challenging back and forth motion that allows the scene to register as a singular experience as well as one that is never unique. It is a painting that never resolves this relationship; it demonstrates that even if a scene is wholly familiar to many, it is rarely openly shared, even if the neighbors just beyond the fence are looking at the same redundant white reminder. Zachary Rawe is an artist, writer, and curator based in Philadelphia, PA. Rawe creates anxious objects and texts invested in affective responses generated from the dissolved relationship between work and leisure. Recently, he began to track his interests on a Tumblr runonsentencereview.